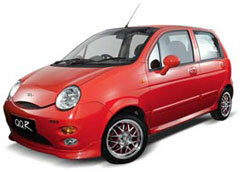 Home » Cars » China » Chery » Chery QQ AMT; assembly by Proton next year? Alado Bumi Sdn Bhd launched the new fully imported CBU Chery QQ AMT today, powered by an automated manual gearbox similiar to the unit in the Proton Savvy AMT. The 52hp 75.5Nm 0.8 litre Chery QQ AMT is priced at RM42,888, while the 0.8 litre Chery QQ with a 5 speed manual transmission sells for RM39,888. Only 100 units of the Chery QQ manual remains, out of the 200 stock that was brought in. In other Chery news, Chery expects to start local assembly of Chery cars in Malaysia in Proton’s plant by next year if talks go well. As for Cam Soh’s other company, IGC which intends to assemble Geely cars in Malaysia, the government has only given approval to assemble 1.6 litre Geely cars here, but not models lower than 1.6 litre. Are we looking at a non-tariff barrier working in action to protect Proton? Click here for a price comparison of the Chery QQ with other models in it’s class.